The UK Independence Party led by Nigel Farage is growing in popularity at a rate that the more established parties find frightening. The party wants Britain to leave the European Union, closing the door to EU citizens, who currently can work freely in the U.K. and create a more restrictive immigration system geared to Britain’s labor needs. UKIP denies being racist or anti-foreigner, but its symbolism is rarely subtle. 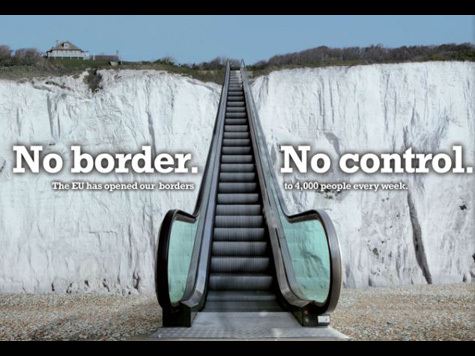 On Tuesday, party leader Nigel Farage unveiled a campaign poster promising to cut immigration, under an image of the White Cliffs of Dover scaled by escalators. UKIP says it’s giving voice to long-stifled concerns. Opponents claim the party is fueling social divisions. Either way, it’s working. Nationally, UKIP is running third in the polls and hopes to win a clutch of seats along the eastern fringe of England, where many voters feel neglected by what they see as London-centric politicians and metropolitan elites. “People are angry. People are looking for somebody to vote for, and they are choosing UKIP,” a Conservative party politician was heard to say. The main parties only have themselves to blame for the UKIP’s popularity for they have steadfastly refused to allow voters a choice on the issue of immigration. Worse, they have failed to respond when voters have expressed concerns, and even called those worried about seeing their culture disintegrate before their eyes “racist” and “xenophobic”. So naturally there is anger. Disparagement and scorn of anti-immigration sentiment is a strategy that is rapidly reaching the end of its shelf life. Politicians who continue to follow that strategy in NZ are going to find they will eventually be faced with the same degree of anger as now exists in the UK. But the real monkey is the high level of debt and the loss of control from sovereign nations, with more and more policy being decided by the EU parliament. The EU will fail it is only a matter of time.